Slice onion thinly and mince garlic. Spray a skillet with cooking spray and heat over medium. Add onions and garlic and cook for 6-8 minutes or until they begin to soften. Toss them in a slow cooker. Sprinkle chicken with lemon pepper, oregano, allspice, and 1/4 teaspoon salt. Rub to fully coat. Add to slow cooker with onions and garlic. Cook on low for 6-8 hours or until chicken is no longer pink. Remove chicken, allow to cool slightly, and shred. Mix yogurt into the onions and garlic left behind in the slow cooker. Add back in the shredded chicken, and season with 1/4 teaspoon salt and 1/4 teaspoon pepper. Mix well to coat evenly. Chop cucumber and tomato. 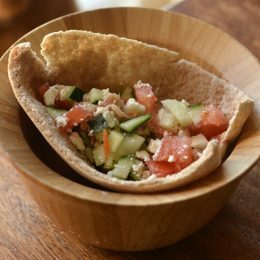 Place chicken mixture on top of each pita; top off with cucumbers, tomatoes and feta cheese. Fold in half, and enjoy with grapes on the side.